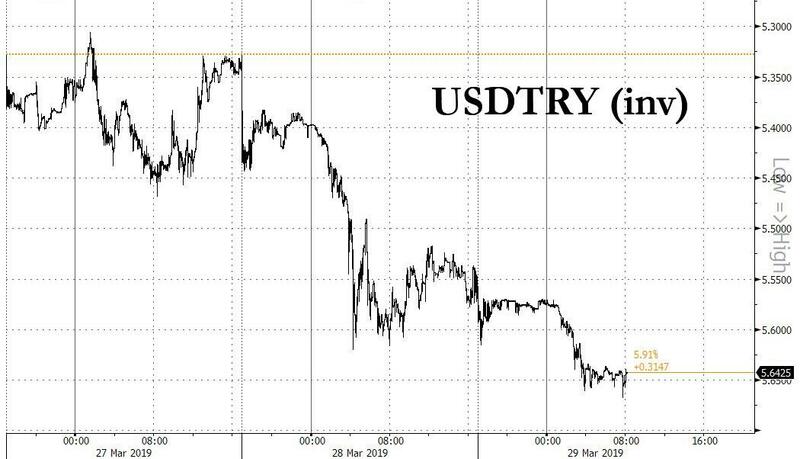 Despite Erdogan's ever more desperate attempts to keep the lira elevated ahead of this weekend's local elections, culminating with sending overnight TRY swap rates to an insane 1300% on Wednesday, consensus is now that after this weekend's catalyst passes things will quickly go from bad to worse for Turkey as Turkish official foreign reserves plummet, putting the nation on the verge of a liquidity (and solvency, if enough foreign investors have lost faith) crisis. This sentiment is shared not only by locals, where government data showed a panic scramble out of lira as Turkish residents increased their their hard-currency holdings for an 11th week running, the longest streak since September 2013, to a record $179 billion, but also foreigners with TD Securties strategist Cristian Maggio tempting fate (and Erdogan's assassination squad) overnight with a recommendation to buy USDTRY calls with a 7.9 target, predicting that "attempts to maintain lira stability ahead of local elections may ultimately prove unsustainable and USD/TRY may move significantly higher when normal conditions are restored." With that disclaimer in mind, Goldman claims that Turkey exposure of EU banks is "limited in scope and scale" as Turkey accounted for <1% of total EAD and c.1% of Net Profit for Goldman's EU banks coverage in 2018: of more 50 banks under Goldman coverage, five have Turkey exposure of >1% of total EAD, with gross exposure ranging from 10% of EAD for BBVA, 5% for Unicredit to 2% or less for ING (2%), BNP (2%) and ISP (1%). Also worth noting that European banks tend not to have 100% ownership of Turkish subsidiaries, so one needs to adjust for the actual shareholding. represents a small fraction of these banks’ overall balance sheets - this is due to the respective Euro banks’ size, diversification and partial ownership of local units. All in, Goldman concludes that the EU bank contagion channel is limited, however in the context of limited contagion. As a reminder, it was just last summer when Goldman calculated that beyond a certain level of the Turkish lira, the country's local banks would collapse. If and when that happens, we strongly doubt that European banks with exposure to Turkey will find their contagion to be "limited."